Most of you have probably already figured this out, I am slower than most. It has taken me 41 years and a couple months to comprehend the magnitude of accumulated effect. In other words, it has taken me 41 years and a couple months to do something other than stand at the starting line, flail, jump up and down, and wonder how am I going to get to the finish line? Baby steps. Start small. Set achievable goals. Yes? Yes; but, I think it goes deeper than that. We drag ourselves down daily in a myriad of ways. We sabotage ourselves, usually subconsciously. But, there are steps we can take to unwind some of those thoughts that we no longer need. That no longer support us, if they ever did. The first step to make is recognizing and understanding that we are doing it. For this first step, it doesn’t matter why we are doing it. Simply a recognition of it makes a difference. How do we recognize it? For example, let’s say I have a goal of writing a novel. And, I can’t figure out why I don’t just start writing one. I have kept many journals about various subject matters I may someday like to write about. But, I’ve not put the blood, sweat and tears into forming and shaping the material into a story. Well, I took some time to listen to myself when I sat down at the keyboard. I began to realize I had a small voice telling me I couldn’t do it. (That small voice can get really loud.) It asks me how could I accomplish such a thing? What am I doing in this scenario? I am standing at the starting line, flailing, jumping up and down while wondering how am I ever going to get to the finish line. If I listen more closely to that small voice, it asks me why start on something I may never accomplish? Why waste my time when so many other things can be done? So, in other words, I am sabotaging myself with these thoughts, and by not putting in the effort to make my goal happen. Two other common ways of undermining ourselves are dilution of personal power and attachments. Years ago, when I first heard of the concept of personal power, my immediate reaction (emotional reaction) was a negative one. To my mind, at the time, the word “power” carried with it a negative connotation. Something that is not necessarily used for the common good. However, as I began to understand the concept, I developed a much greater appreciation for personal power. How else do we dilute our personal power? A few more examples are expectations we have of others, blaming others and attachments. Recently my husband and I were leaving to return home after a vacation. I didn’t want to leave. He had vacationed, it was time to go, time to move on. I, on the other hand, had an attachment to place. That didn’t necessarily surprise me. I know that about myself. But, you see, I don’t want attachments like that. Why? Attachments cause pain and suffering. The desire to hold onto something causes pain and suffering. (It is not the enjoyment of the vacation that causes the pain and suffering. It is the attachment to the enjoyment. Big distinction.) Attachments weigh us down. It causes us to get stuck. In many ways, it chains us to the past making it difficult to move into the future. It dilutes our personal power. Just because I don’t want attachments doesn’t mean I’ll snap my fingers and I’ll no longer have those feelings. I am sure I’ll have attachment related feelings the rest of my life. But, I’ve made a small step forward by recognizing it. Dilution of personal power and attachments remind me of aparigraha. It is a Sanskrit word meaning non-attachment, non-possessiveness. It calls for a letting go of whatever the individual is holding onto. It is a favorite of mine. I first learned of aparigraha about six years ago. A yoga instructor mentioned it in a class I was attending. I don’t recall the context; but, I’ve heard alot of Sanskrit words and that one stuck with me. A letting go, a non-clinging, non-possesive call to action. I believe the reason it stuck with me is because although I’ve made progress in this area, I still have a lifetime more to do. And, that is ok. 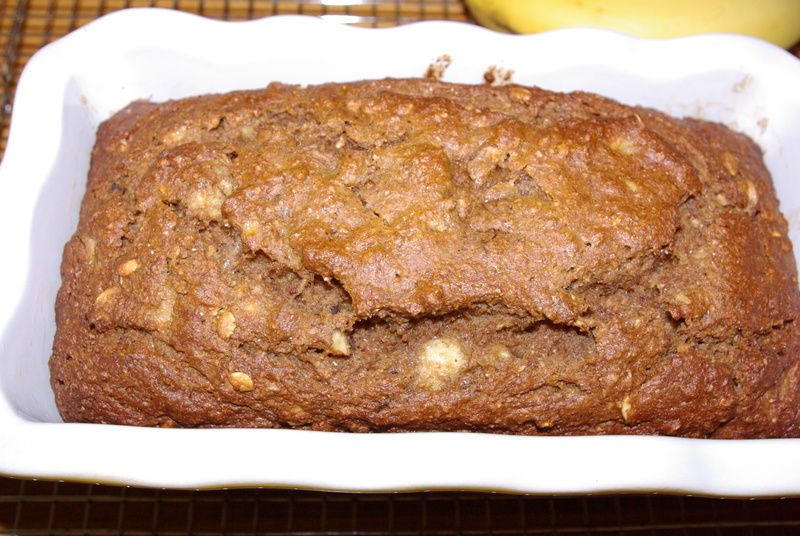 It was a toss-up today between banana bread and roasted apples. I am a big fan of both. But, if I had to pick one, it would be banana bread. You can’t beat it in the morning with a mug of coffee. 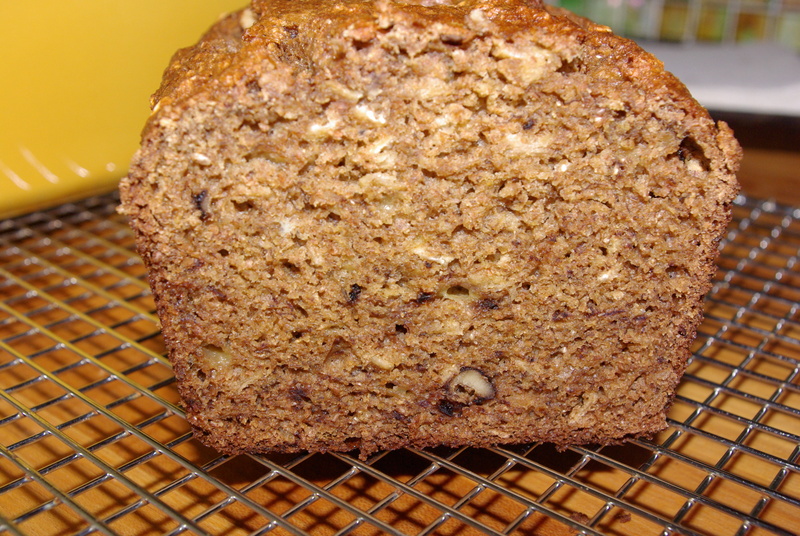 I’ve made banana bread lots of different ways. I’ve made it with all flour, no oatmeal. I’ve tried fewer bananas, no nuts. Below is one of my favorite ways to make it. It ends up being quite dense with loads of flavor. This is not a sweet bread. Serve with honey if desired. Preheat the oven to 350 degrees. Butter a loaf pan. Set aside. In a medium size mixing bowl, peel and mash bananas, set aside. 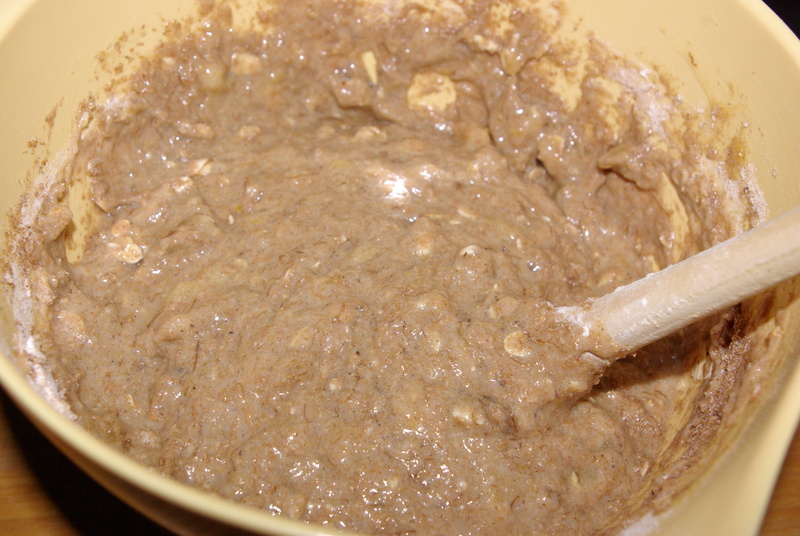 In another medium size mixing bowl, combine the flour through the salt. With either a hand held mixer, or a whisk, combine sugars and banana mash. Mix until well combined. Add eggs and oil. Mix until well combined. 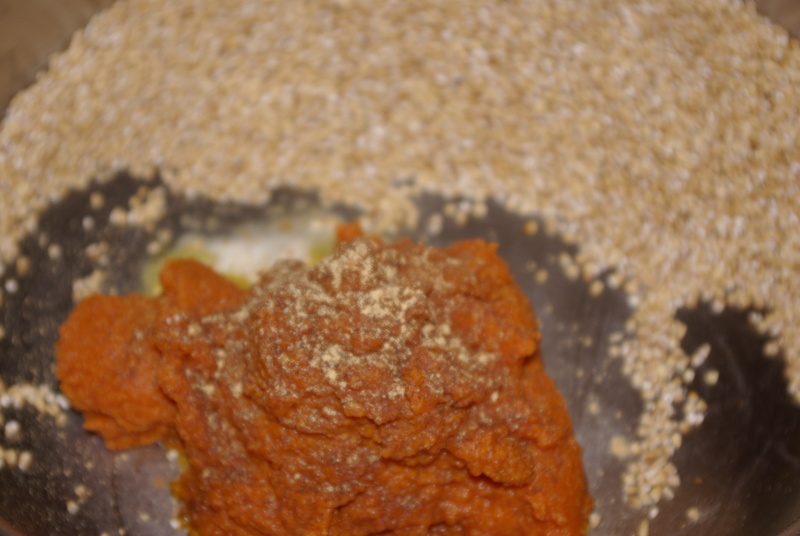 Add the wet ingredients to the dry flour mixture. Mix until combined. Fold in walnuts. 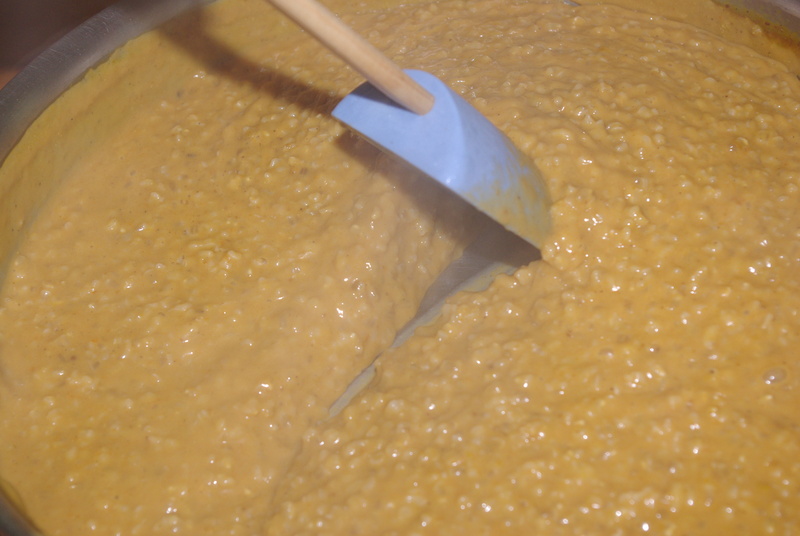 Pour the batter into the buttered loaf pan. Bake at 350 degrees for 55 – 60 minutes until a toothpick or knife inserted comes out clean and the top of the loaf is golden brown. Let cool on wire rack for 10 minutes. Turn out loaf to cool further. As much as baked oatmeal and spiced molasses cookies have been on my mind lately, truth has as well. What is truth? Do each of us have our own personal truths? How can individuals view reality differently, if we do? I have a need to come to an acceptance about this. Or, at least, an acceptance of it as it relates to who I am now. Certainly, there are universal truths that can be and have been scientifically quantified. But, personal truths seem to be a different matter. It is all relative. The exploration of truth led me to the theory of relativism. (Stick with me here, I won’t stray too far from baked oatmeal.) In my limited understanding, relativism is a concept that explains there are varying points of view and frames of reference from which each of us view situations, there are no absolute personal truths. Wikipedia defines truth, in part, as a “state of being in accord with a particular fact or reality.” In other words, an individual’s frame of reference and viewpoint will directly impact their perception of reality. In following, it seems, one’s perception of reality will impact their truth. Invariably, I come back to personal truth is always relative to a particular point of view, set of beliefs, or frame of reference. Thank goodness oatmeal is easier to struggle with than truth. I tried different variations of baked oatmeal only to be disappointed. 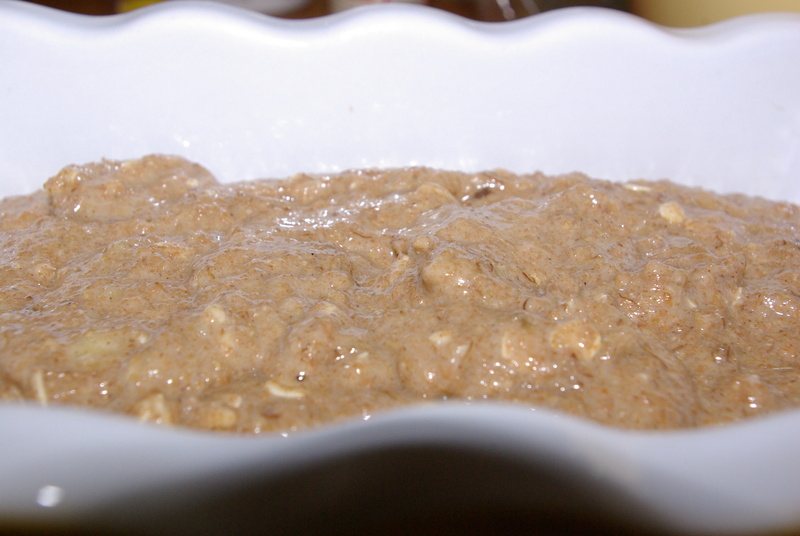 While the ingredients were appealing, oatmeal, milk, eggs, butter, raisins, the result wasn’t what I anticipated. The final product didn’t have enough flavor. The texture was too dry. I was after a creamier consistency. So, I started thinking about the dish from the bottom up. For some reason a pineapple upside down cake sprang to mind – wouldn’t it be nice to have a sweet surprise at the bottom of the dish? A sweet surprise that also lends a great deal of moisture…. and sprinkled with cinnamon and nutmeg. Cooks Note: Not included in this recipe, but I think would make a good addition, are sliced almonds. Next time I make this dish, I’ll add 1/2 c. sliced almonds to the dry mixture. This dish is best eaten warm out of the oven. 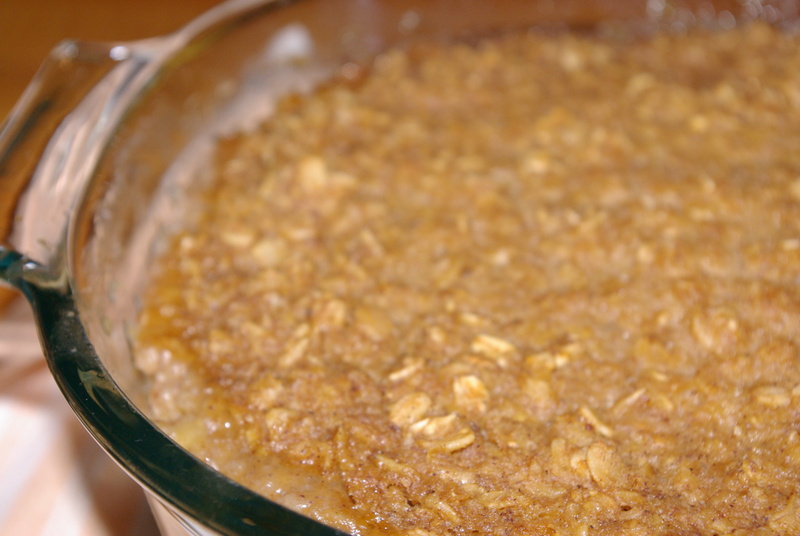 However, leftovers heated up, topped with a little milk, honey, or applesauce is good also. The brandy is optional. I often use a little bit with baked apple dishes. 1. Preheat oven to 350 degrees. Butter a 2 quart baking dish. Set aside. 2. In a medium size mixing bowl, mash the bananas with a fork or potato masher. Spread evenly in baking dish. 3. Thinly slice the apples. Layer them evenly over bananas. Sprinkle banana apple mixture with 1/2 t. each, cinnamon and nutmeg. Set aside. 4. In same medium mixing bowl, combine the dry ingredients, oatmeal, brown sugar, baking powder, salt and remaining 1 t. each, cinnamon and nutmeg. Stir to combine. 5. 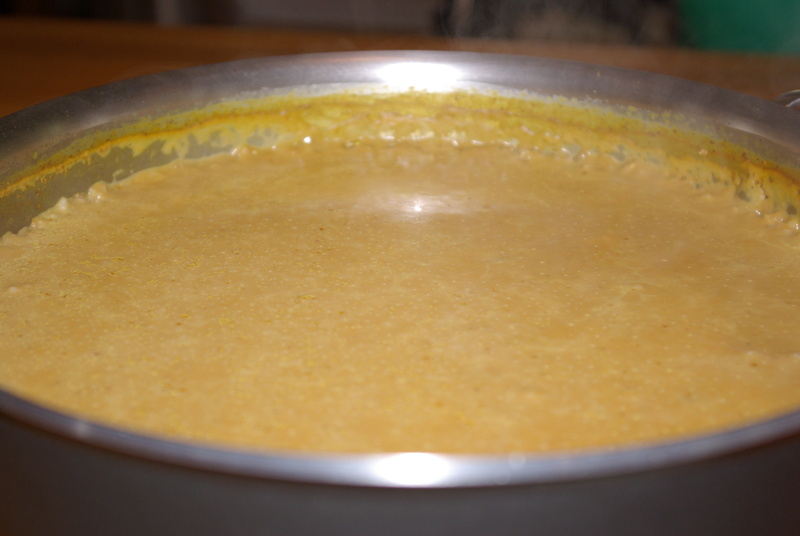 In a separate bowl, mix the wet ingredients until combined. (The milk, egg, applesauce, molasses, melted butter, and brandy, if using.) Pour the wet ingredient mixture into the dry ingredient mixture. Stir to combine. Pour evenly over the banana apple mixture. 6. Bake at 350 degrees for 30 minutes. Increase heat to 400 degrees. 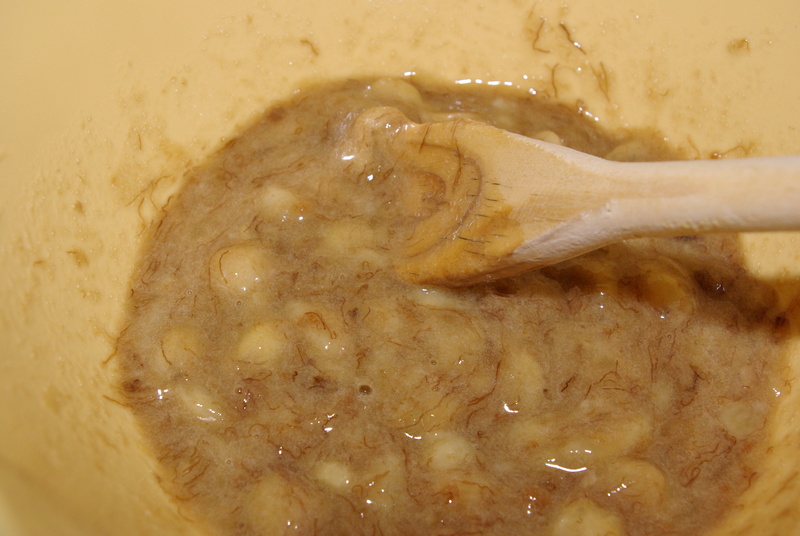 Bake for another 10 – 15 minutes until top begins to brown slightly. Serve warm and ponder truth.